More details have emerged on a scapegoat caught at C.M.S while robbing innocent motorists in the early hours of Tuesday August 25th, 2015. 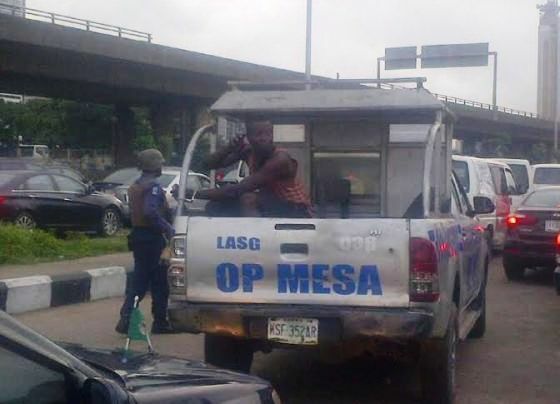 According to a source who shared the above photo on Facebook, the man used a toy gun to rob several motorists of their valuables for close to 8 minutes before two brave motorists kicked the gun out of his hand and held him till OP Mesa troops arrived. The unidentified criminal is the first traffic robber to be caught while robbing in the area. GOVERMENT-CAN-NOT DO ANYTHING ABOUT IT THE ONLY WAY OUT IS FOR GOD TO KILL EVERY CRIMINAL IN NIGERIA! EVEN THE GOVERMENT ARE CRIMINALS! End of the road for him, God will bless the two brave men who took it upon themselves to save others.